The prevalence of HIV and AIDS in South Africa is an issue that continues to define the country and its citizens. It is estimated that more than 6 million South Africans live with HIV/AIDS. This is more cases than any other country in the world. 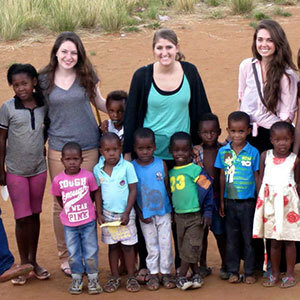 In the spring, Robert Sedlack, associate professor in the University of Notre Dame’s Department of Art, Art History and Design, traveled with a team of 11 students to Johannesburg to gain firsthand perspective on the problem and collaborate with South African community organizations. The designers have created a wide range of solutions, including an online support community for young women, a video series and HIV-related educational materials for children, which they hope to share with teachers and community advocates. “The social model of design that we’re teaching students and that they’re practicing is using design to inform people, to educate people, to help change opinions, to help people grow and learn and live better lives,” Sedlack said. Originally published by Carrie Gates at al.nd.edu on Nov. 4, 2013.